Has anyone tried painting them the color of the car? Mine is the metallic blue and I was thinking of going in that direction. Would that look good if I painted it the same color as the body or just go black? Also, how do you get the corner lights apart becuase someone said that it is different. Thanks. ive painted a set of 03 factory color and they look great every one compliments on them its all in ur taste if u think ud like it matching go for it or u can get custom covers n paint them to really see if u like the match look. i had tried it few years ago on bike handle bars and it basically turned out looking like tin fool color/ silver i think was a waste. yet i did use metal cast on a metal tank n it turned out nice. dont smoke the lenses big mistake. ive been in the cars when they have the removable headlight covers in smoke and the driver forgot to take them off. hardly see S^&t. also a buddy of mine had me install a set of smoked headlights on his truck and even with hids you could barely see what was infront of you and that was a very light tint smoke on them. we ended up changing to updated crystal clear lenses instead. headlights you dont wanna mess with when it comes to their visability. but if your determinded to nightshade useing a fine coat should be enough for your look but just me i wouldnt even try tinting period. hey, might be a stupid question, but what kind of paint did you use when you painted the head lights, do i need a certain kind? yea i was wondering the same thing as brennan..what type of paint do i need?. And so you can paint the whole headlight housing black and it will still light up good and be legal? How would gloss black look??? Or red? My buddy's got a red cavy and I'm thinkin it would look good painted like Honda Fits!? 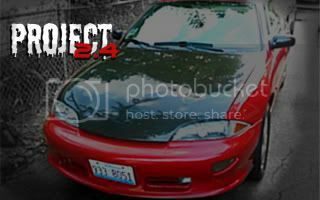 im gonna get another set of sunfire head lights and play with them, or has anyone done anything to a sunfire headlight yet? elisa give me few mins ill take a pic and post i did victory red ones on a set of 03-05. to give u a idea of the look. cell pic and it is raining here soo lol. anyway the victory red is the accual paint on the car they are for. they are painted and clears just like the car not spray can paint. these came out great and match the car perfectly. anyone do this on a 98? Anyone ever painted on an eye-lid? 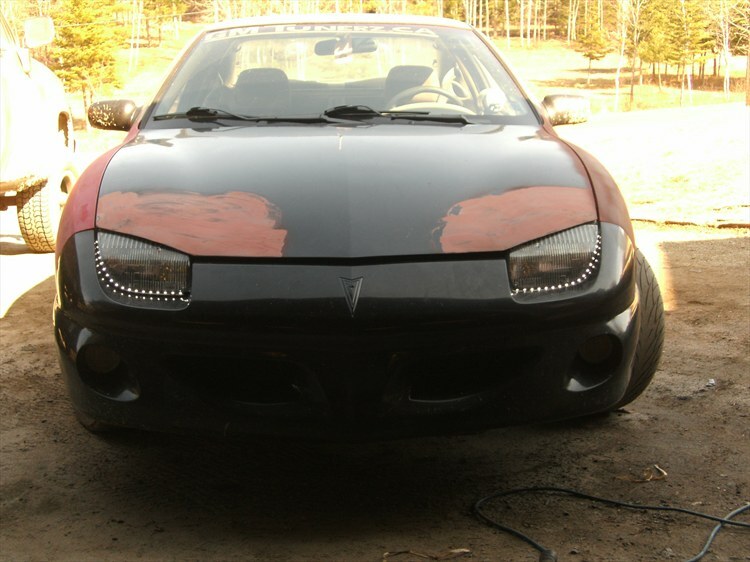 That seems to be done a lot with sunfires to get the evil eye look, Real eyelids are better but, it can be a good substitute for low a budget. 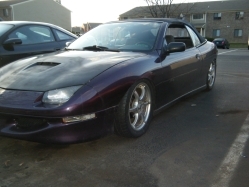 i plan on doin a 00-02 headlight swap on my gf's 98 and turning it into a 00 z24 with the brickyard spoiler and body kit. 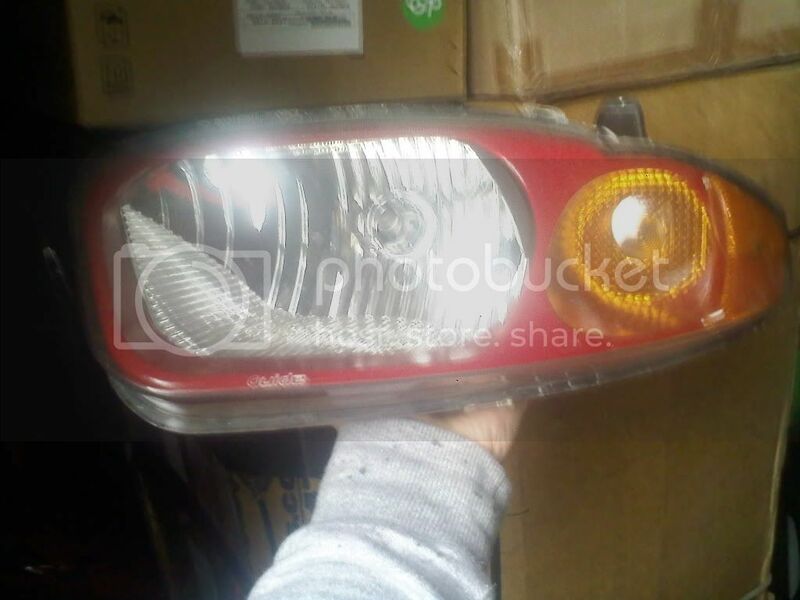 i am goin to paint the headlight surround but not the inside curved part but was wondering about the bulb cover thing. can it be painted or is it going to block the light too much? also does any one sell clear covers for them? i want to make a set to put on at shows that are painted solid body color. also would wally world ultra flat camo black paint work. i painted a tailgate and hood on my ranger and i am in the process of doing my euro tailights like these headlights. btw i love the info so far and appreciate any help u guys can give. the threads i have been reading are very uselfull. will post pics of stuff being done as i take it all apart and start prepping. "hey meg ya 18 yet? alright""so meg hows it feel to be 18? ""im only 16" "so hows it feel to be 18?" Hey everyone that wants to do black corner lens i did it just the other day and what a pain(make sure u have a back up pair of corner lenses) ok i order a set of clear corners and i tested my stock ones first and here's how it goes. Oh this will take a few hours so make sure u got the time to spend on it. Things you will need: two different size flathead screw drivers( so a normal one and an a small one), black or clear sealant, 3m painters tape, and have to be patient while you Slowly pry lens off, if not it will crake or break!! !